After the above 10 minutes video introduction from @hamids, lets find the roots of Scrum first. The first Scrum team was created directly from a paper which is required reading for any Scrum practitioner. Read Roots of Scrum: Takeuchi and Self-Organizing Teams for more details. Small working teams ( @richardbanks suggest 7+-2 team members). Deliver finish product frequently in Small batches – Continuous Deployment. Enable releasing product whenever required – Continuous Delivery. All project metrics, reports, and details are prominently displayed. Project status is displayed on a white board with post-it. Multi-disciplinary and self-organizing team. Team make the decisions themself. No specific engineering practices prescribed. Rather then counting man hours scrum team do product progression in a series of sprints(Time box iteration). Requirements are captured as items in a product backlog. (Master list of all work the team will do). Now, lets watch what @kschwaber has to say about Scrum. 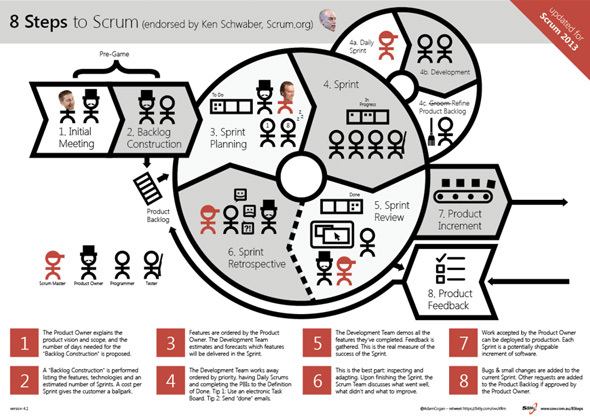 @adamcogan has complied The 8 Steps to Scrum PDF, endorsed by @kschwaber. Print and stick it on your wall. In Scrum you have following Scrum ceremonies (meetings). Following are some points on what you do in each of the following ceremonies. Create sprint goals (high level objectives). Product owner, scrum master, team members (developers) attend these meetings. Ideally starts on Monday after the last sprint. Team members select items from the product backlog. Discuss the fine details of implementation. The daily scrum(daily stand up 15min). What are the impediments in your way? Show new features or demonstrate the software. Do not spend more than 2 hours of preparation. Don’t show slides, just show code. Invite everybody who is interested. This is the Kaizen part (continuous improvement). Discuss what is and what isn’t working. This meeting is done after every sprint review. Whole team participates, possibly customers and others. What will we stop doing? What will we continue doing? Above figure: It is key to the success of Scrum to know who the pigs are and who the chickens are. View a translated version here — now available in 10+ other languages! Read Do you know that working in a Team is better than on your own? Read Ways To Learn About Scrum on scrum.org. Download and read the Scrum Guide from scrum.org (16 page PDF on 23Dec2011). Read Rules to Better Scrum using TFS on ssw.com.au (big blog). Read Done – Do you go beyond ‘Done’ and follow a ‘Definition of Done’? and Definition of Done. Take the Scrum Open assessment. If you are a developer like me, then attend the Professional Scrum Developer .NET course and then you could do the Professional Scrum Developer Assessments. Also see The Professional Scrum Developer from scrum.org. After you pass the exam with flying colours, it’s time to implement Scrum in your team. Read and use the Contracts for Implementing Scrum. If you want to support a software development team’s efficiency, effectiveness, and continual improvement look at The Professional Scrum Master on scrum.org. Feel free to suggest other tops I may have missed in the comments! Enjoy! Do you use printed ‘SSW Story Cards’ with your customers in the Spec Review?